Having pancakes for breakfast is just the best, isn’t it? Luckily in Rotterdam you can find lots of amazing hotspots for breakfast, and plenty of these hotspots have fluffy pancakes on their menu. 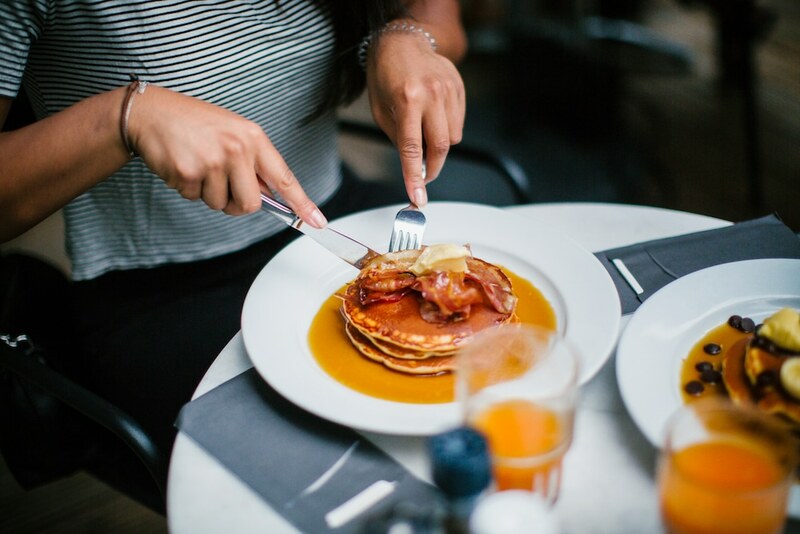 From vegan pancakes to pancakes with bacon, from sweet to savoury, there are enough options in our city. If you’re wondering where you can find the best pancakes in Rotterdam, you’ve came to the right place. Below I share 9 hotspots in our city that serve the tastiest pancakes. Enjoy! Arzu is definitely one of the best spots in Rotterdam to get your stack of pancakes. With 13 (!!) options on the menu, there has to be a perfect pancake for you too. Are you a real sweet tooth? Go for the Red Velvet pancakes with cream cheese and white chocolate, the Oreo brownie pancakes with pure chocolate, the Mars and Murries Nutella pancakes with M&M’s or one of the other unique, sweet pancakes. 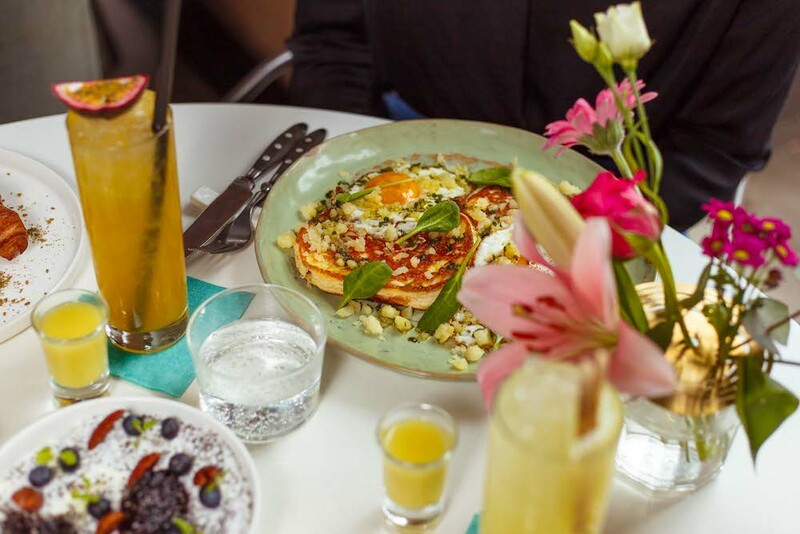 If you’re looking for savoury pancakes, Arzu also has you covered with their Popeye pancakes with spinach, feta and eggs. There are also several pancakes at Arzu that can be served completely vegan. And it’s possible to order extra’s to personalise your pancakes even more. Oh, and let’s not forget the most important thing…. All their pancakes are served with Arzu’s delicious homemade caramel sauce! An article about pancakes in Rotterdam should include Lilith. Their stacked American pancakes are among the tastiest of not just Rotterdam, probably one of the tastiest pancakes you will ever eat. The pancakes at Lilith come in all sorts of flavours, with a wide variety of toppings. 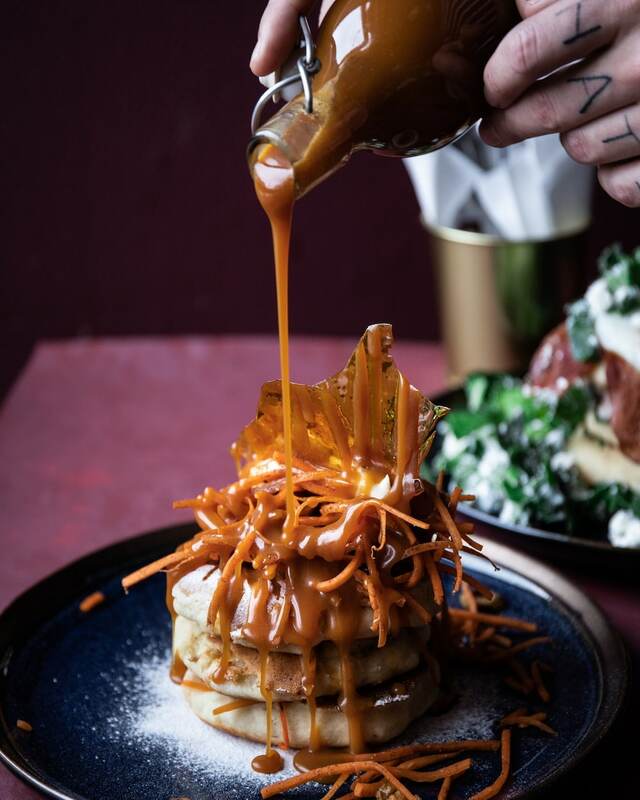 If you decide to go for their American pancakes, you can expect delicious maple syrup, sour cream and other toppings of your choosing. These toppings include warm blueberries, banana, Nutella, strawberries or organic bacon. Rolph’s Deli should be high on your list for any type of breakfast, because here they serve all kinds of delicious breakfast dishes, all day long! 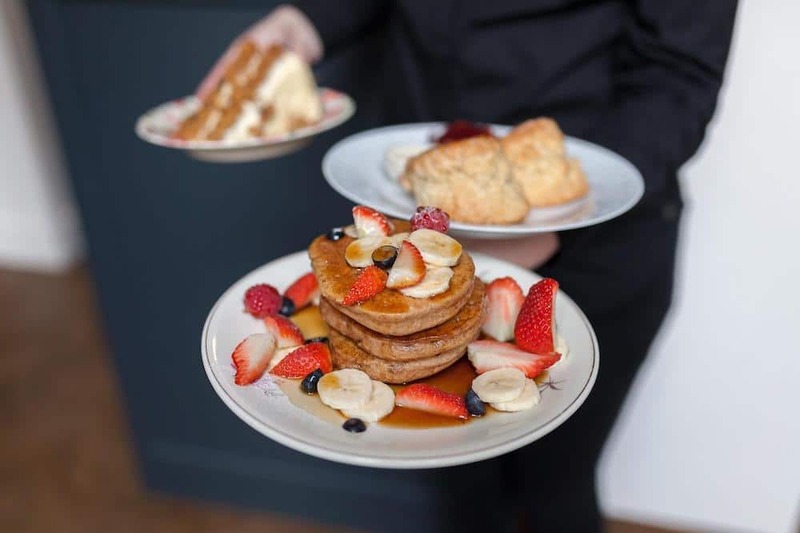 So, it doesn’t matter what time of day you’re craving pancakes, at Rolph’s Deli you can get it at any time (within their opening times of course). You can choose your own toppings for the pancakes at Rolph’s Deli, such as blue berries, banana, Nutella, strawberries or bacon. Yum! By Jarmusch is a typical American breakfast diner where you can either relax in one of their booths or take a seat at their counter and order their all day breakfast. 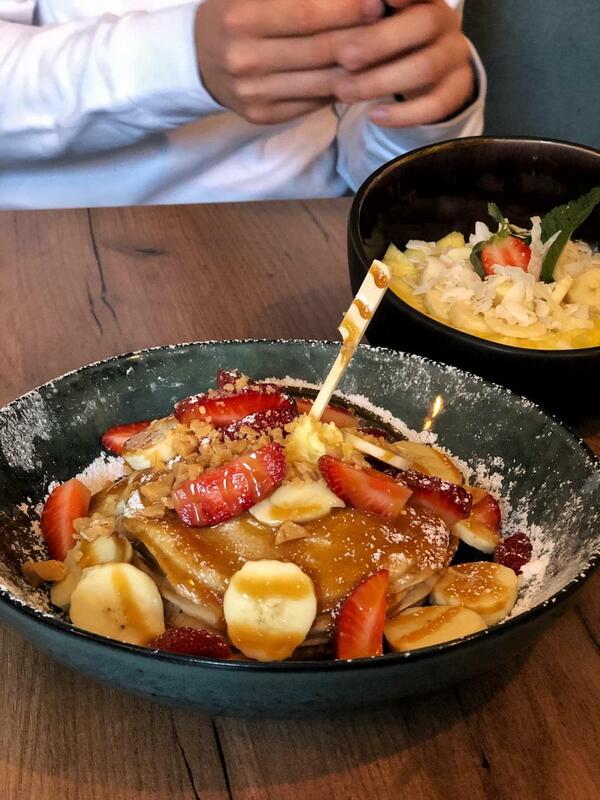 Next to classic breakfast options, such as Chicken and Waffles, or healthy breakfast options, such as their Mango Pitaya Bowl, you can decide to order a stack of fluffy pancakes. If you go for pancakes, you get a stack of three pancakes with a topping of your choosing. And there are plenty of options: banana, peanut butter, blueberry, chocolate chip, apple caramel or bacon. I know what I’m having during my next visit. Bertmans in Rotterdam is a great hotspot, and amongst all their delicious breakfast options you can find pancakes. The pancakes at Bertmans are made of buckwheat and almond milk and are gluten free and vegan. There are several delicious toppings to choose from: banana, blue berries, mint leaves, maple syrup, cashew and vanilla cream or apple, cinnamon rooibos cashew cream and maple syrup. Delicious for sure! They don’t only serve great coffee at Coffeelicious, but also a great variety of all day breakfast dishes. Fresh scones, scrambled eggs, or their Morning Glory which is a shared breakfast for two. But, let’s not beat around the bush, you’ve came here for pancakes and of course, Coffeelicious also serves a great stack of fluffy, tasty pancakes! 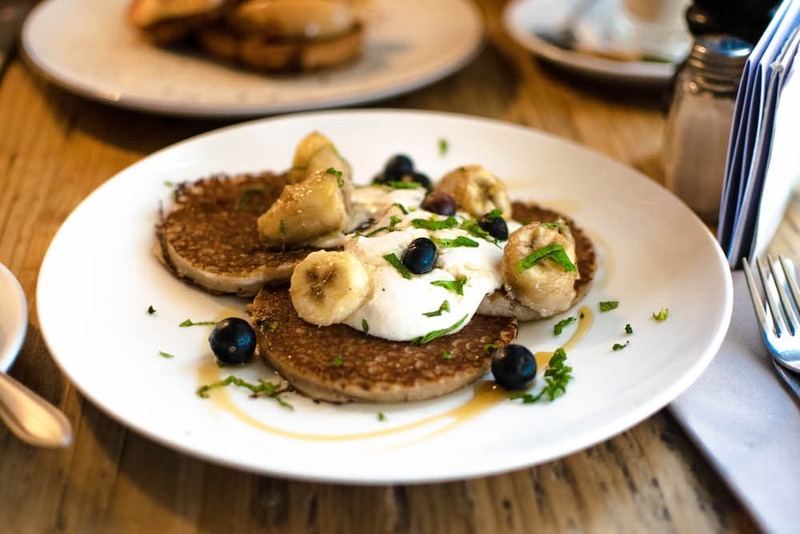 You can decide to go for the vegan banana pancakes or their signature Coffeelicious pancakes. The Coffeelicious pancakes are topped with fresh fruit, powdered sugar and maple syrup and taste amazing, trust me! If you’re craving for pancakes for brunch or lunch, then Ayla is the place to be. They offer both sweet and savoury pancakes. What about their salted caramel pancakes with dates and pistachio, or their pancakes with fried eggs and bacon, hazelnut and dukkah? These aren’t ordinary pancakes, which makes it all the more worthwhile to visit Ayla! 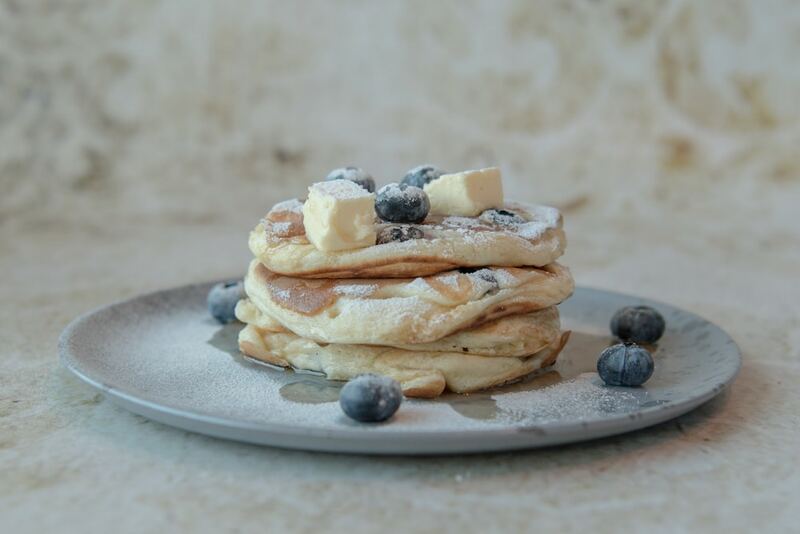 As I’m writing this article, Mr. NonNo has only recently opened up in Rotterdam, but already I’ve heard so many amazing things about their pancakes that it had to be included in this article. This laid-back food and coffee bar offers all day breakfast, with various vegan and vegetarian options. They offer ten types of pancakes (also vegan!) and you can easily add all sorts of toppings, so basically you can create your own pancake! But there is also enough to choose from on the menu. 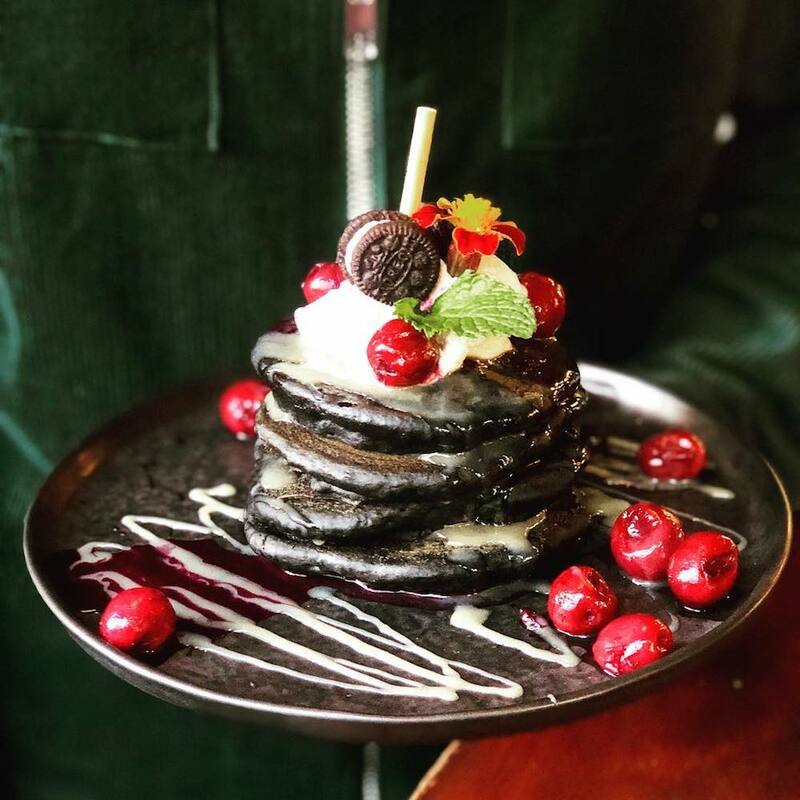 Just a handful of the names of the pancakes are Walk in A Fruity Forest, Bring Me To Oreo Heaven, From Green Tea To Strawberry and Caramel Dipped Banana. Doesn’t it all sound so good?! Altijd in de Buurt is the perfect hotspot for breakfast! And there is plenty to choose from for the real pancake lover. Their menu is filled with various pancakes with names such as Oh My Applepie, Mango Madam Jeanette, Sensation Red and Peer and Pruim… I’m really hungry now! 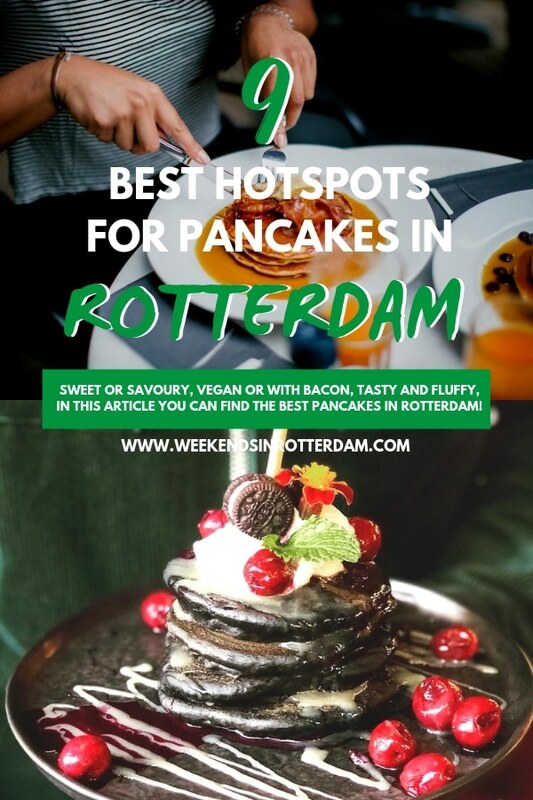 That were 9 hotspots in Rotterdam where you can go for some mouthwatering pancakes. Where in Rotterdam have you tried the best pancakes? Let us know in the comments below and we will definitely check it out! Your post couldn’t be better timed! I’m off to Rotterdam next week and would love to treat us to a great brunch. I was hoping you might have some good suggestions, but wow, there are so many incredible place to eat in the city. Can’t wait to explore some of them – thank you so much for he inspiration! These look so DIVINE. so lucky holiday calories don’t count!